fungi [photo courtesy Brian Frischmeyer]. mong a number of corny oddities that appear from time to time is one that falls into the "kernel disorder" category. 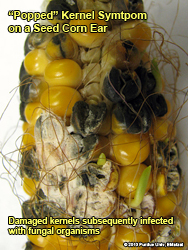 A crop consultant once reported on the occurrence of a symptom in a seed corn production field known as "popped kernels". In his words, "...the kernels appear diagonally sliced. Each sliced half is then folded back exposing the endosperm, which later receives the fungal attack." 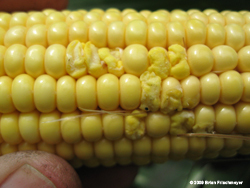 The popped kernel symptom and the related "silk-cut" symptom are indeed corny oddities in that they rarely occur in commercial hybrids in Indiana and occasionally occur at significant levels in seed corn inbreds. 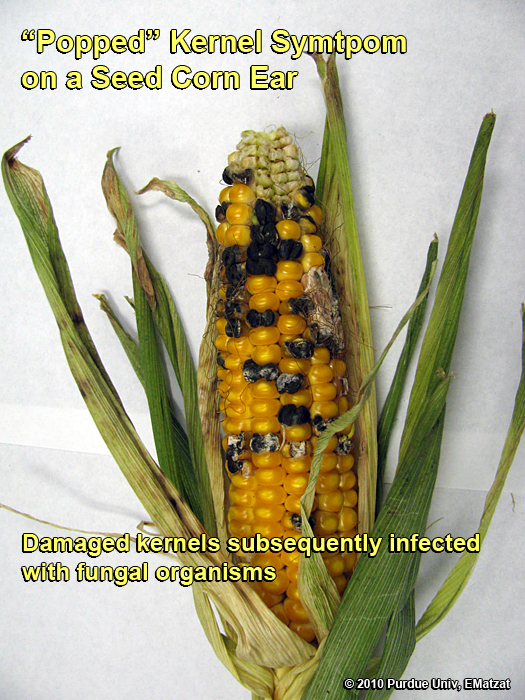 Unfortunately, when the symptoms do occur, they predispose the affected kernels to attack by ear-rotting fungal organisms. The causes are unknown, but are believed to be related to stressful conditions following pollination. A report from Texas, for example, suggests that the silk-cut symptom occurs quite frequently in areas of south Texas prone to late-season drought stress (Odvody et al., 1997). "Popped kernel and silk-cut, although common in breeders' nurseries, are rarely seen on commercial hybrids. It is assumed that this characteristic is inherited, and it is usually eliminated during the breeding and selection process. 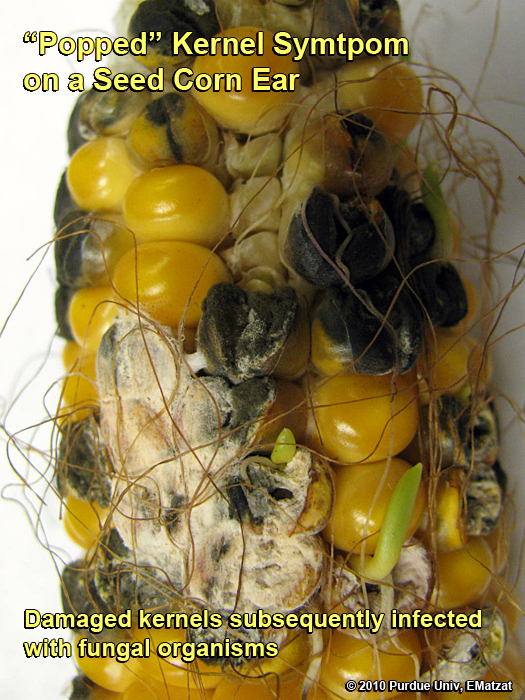 Popped kernel is an irregular break in the seed coat over the kernel crown. The kernel resembles a partially expanded popcorn kernel. 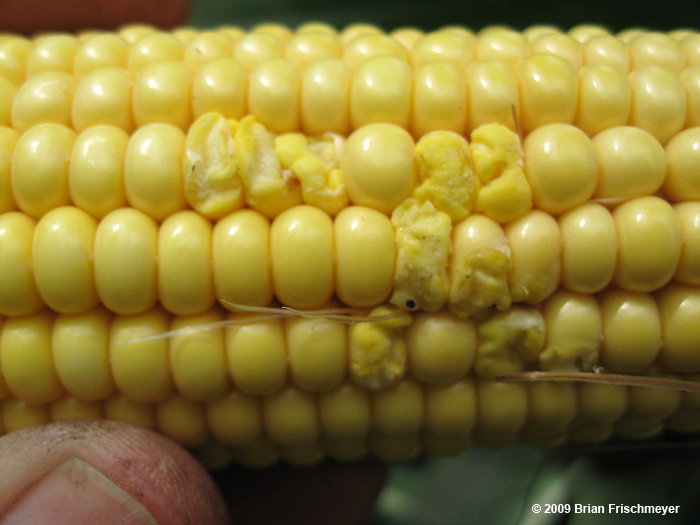 This phenomenon is believed to result from irregular growth because it is most common during years with irregular rainfall, particularly when conditions are very hot and dry.Silk-cut is the embedment of silks in ruptured areas on tips of the kernel or occasionally in the sides of kernels between kernel rows. The exact cause of silk-cut is unknown, but it may be caused by irregular growth of the pericarp around unpollinated silks. Even on an ear that appears to be fully pollinated, as many as 10% of the ovules are not fertilized. Pollinated silks die and dry up, but silks attached to unpollinated ovules remain viable for an extended period of time. The viable silks push against the developing pericarp of kernels, causing the pericarp to rupture. Both popped kernel and silk-cut result in the rupture of the pericarp and allow infection by ear-rotting and saprophytic fungi." Odvody, G.N., N. Spencer, and J. Remmers. 1997. 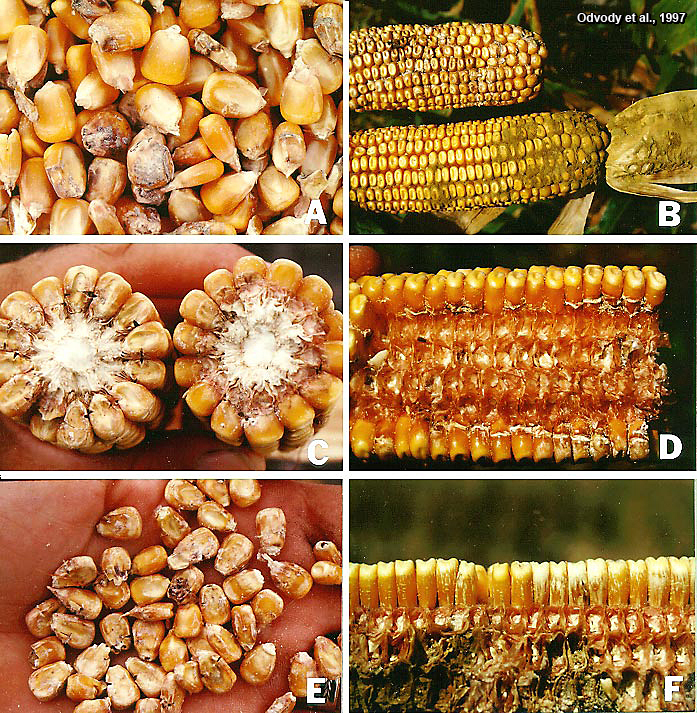 A Description of Silk Cut, a Stress-Related Loss of Kernel Integrity in Preharvest Maize. Plant Disease 81 (5):439-444. [online] http://apsjournals.apsnet.org/doi/pdf/10.1094/PDIS.1997.81.5.439 [URL accessed Aug 2010]. Vincelli, Paul, Chad Lee, and Ric Bessin. 2010. Some Unusual Kernel Injuries. Kentucky Pest News, Univ of Kentucky Extension. 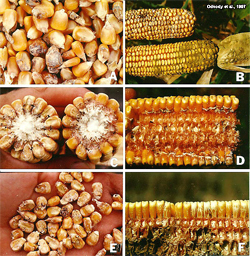 [online] http://www.ca.uky.edu/agcollege/plantpathology/extension/KPN Site Files/pdf/KPN1241.pdf [URL accessed Aug 2010]. White, Donald G. (ed.). 1999. Noninfectious or Abiotic Diseases. 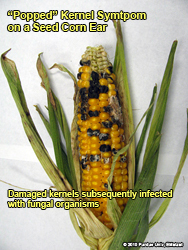 in Compendium of Corn Diseases (3rd Edition). APS Press, The American Phytopathological Society.